As more radiology departments and mammography facilities transition to digital images, management personnel must consider how to digitize mammography priors and catalog the rows of films stored on shelves in film libraries. The basic options are to handle file room management and film conversion in-house or seek an outside service provider to store and digitize those priors so vital to effective mammogram screening. When the imaging department at Piedmont Fayette Hospital in Fayetteville, Ga., faced this decision, management looked no further than the system’s flagship facility, Piedmont Medical Center, for an answer. When the parent medical facility implemented digital mammography, it took a phased approach to the process, where staff at the medical center would scan patients’ priors in-house. With that, Piedmont Fayette, a 157-bed community hospital with a modern diagnostic imaging department, replaced five analog machines with four digital machines at one time. Woods was director of radiology when the hospital implemented digital mammography in November 2009. As executive director of patient services, he continues to have executive oversight of radiology at the hospital. “We felt it was best to simply eliminate the analog process for workflow and quality purposes,” he says. Piedmont Fayette Women’s Imaging Center manager Lisa B. Jones says one factor in the decision-making process was that the facility was running out of space to store films. The facility knew it was getting a digitizer with its digital mammography system, so management decided to digitize prior studies in-house. The total transition to digital created a greater impact on Piedmont Fayette than expected. Most notable was the need for staff and digitizers to keep up with the demand for digitizing prior mammogram films for comparison with newly acquired digital exams. Staff started digitizing priors on an “as-needed basis,” working one or two days in advance. After one month, the facility realized that one staff person working at one digitizer day-in and day-out was not going to be enough to keep up with demand for digitized priors. Altogether, hospital staff spent four months digitizing their own priors. The process of scanning film images isn’t as simple as making a copy. It requires capturing specific information from the films into high-resolution images in a way that the data can be integrated into a PACS and compared with current digital images. That’s when Woods and others at Piedmont Fayette decided to turn to an outside resource for help in managing its analog film library as well as providing on-demand image conversion. Working with both film and PACS images at the hospital requires resources to manage both processes and can be a workflow bottleneck. 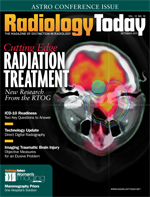 This dual-format environment also makes work more difficult for radiologists, forcing them to compare images in two different formats. Mammography priors provide essential information for comparison with current studies even after new digital management systems are in place. Working with film and digital images is more time consuming. Coursey-Prah agrees with Woods that starting at the beginning and switching everything to digital at one time was the best way for Piedmont Fayette to go. “The change was more uniform that way,” she says. There is also the matter of meeting image retention requirements. While past films take up storage space, federal Mammography Quality Standards Act (MQSA) statutory retention requirements call for medical facilities to maintain mammograms for five or 10 years, depending on whether subsequent mammograms are done. State and local laws may require keeping records even longer. Even when film images are digitized, the analog images must be retained for the appropriate length of time. Piedmont Fayette selected SourceCorp’s Mammography Total Archiving Program (mammoTAP) to take on the process of digitizing its mammography priors while managing the hospital’s entire analog archive at SourceCorp’s Kentucky location. The process begins with clerical staff member Gayle Hurley reviewing the mammography center’s 10-day schedule. After looking for existing priors, Hurley submits an online request to SourceCorp for any priors not in the PACS. Those priors are located by SourceCorp, digitized, and then sent to the hospital’s PACS. Radiologists are then able to pull up those images for review with the new exams. Hurley agrees with Jones that the process worked out with SourceCorp has been a good move for the hospital. She was the staff member handling the in-house digitizing and, while she says they did their best to keep up with demand, it was a long four months of scanning. That workload has eased, however. When a patient makes an appointment for a mammogram, Hurley checks to see if the hospital already has electronic priors on that woman. If not, she contacts SourceCorp, requesting images from the previous two years. “The radiologists would have nothing to make comparisons with without that,” she says. If a patient is new, Hurley requests that she bring any prior films with her for the exam. Her priors are then sent to SourceCorp, scanned, and added to the hospital’s PACS. When digitizing images for Piedmont Fayette, SourceCorp adapts the images to meet protocols requested by the radiologists. Coursey-Prah notes that there is a certain look to digital images that can differ depending on the settings when an image is digitized. Initially, digitizing priors with SourceCorp took longer, simply because there were more films that needed to be converted in the beginning. Over time, more films were digitized and there were fewer analog images that needed to be converted, reducing the scanning costs for the hospital. “As the volume of digitized priors goes down, our cost goes down,” Woods says. SourceCorp keeps track of retention dates for patients’ images and notifies the hospital when it’s OK to remove them from their libraries. “It’s nice to have someone keep track of image retention dates,” Woods says. While Woods says this total emersion into the digital imaging world was a step in the right direction for the hospital, the transition didn’t come without a few apprehensive moments. Most notable of those was the physical transfer of their room full of films to an off-site location. He points out that access to priors is vital to proper mammography screening. Letting go of those tangible, hard-copy images was something he had to work to get past. During the transition, there was only one day where the hospital did not have access to films, Jones says. The film files were kept in the correct order and reshelved accordingly at the SourceCorp site. Now, requests for images are fulfilled within 24 hours, whether they’re digital or analog. With this method of handling mammography priors firmly entrenched at Piedmont Fayette for the past two years, the one remaining issue involves what to do with the vacancy at the facility.